"Reminiscent of most college dorm rooms worldwide, the witty design group ATYPYK (always thirsty for ideas) just announced their latest product: The 6 Pack Vase. The small, probably plastic accessory piece holds the half dozen used beer cans together, adding a design element to what is usually considered trash. 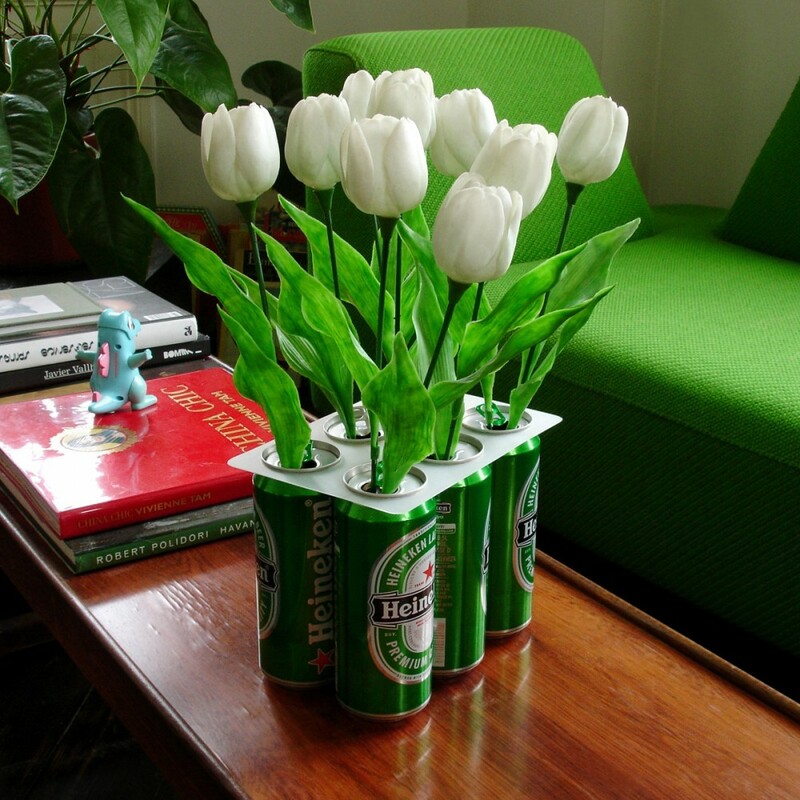 I have to admit it actually makes it look pretty decent– especially the color of the stems against the green cans. ATYPYK the same clever designers that brought us the Christmas Tree Poster and concealed gun shirts, always make me think twice about other uses for items I see and interact with on a day to day basis." 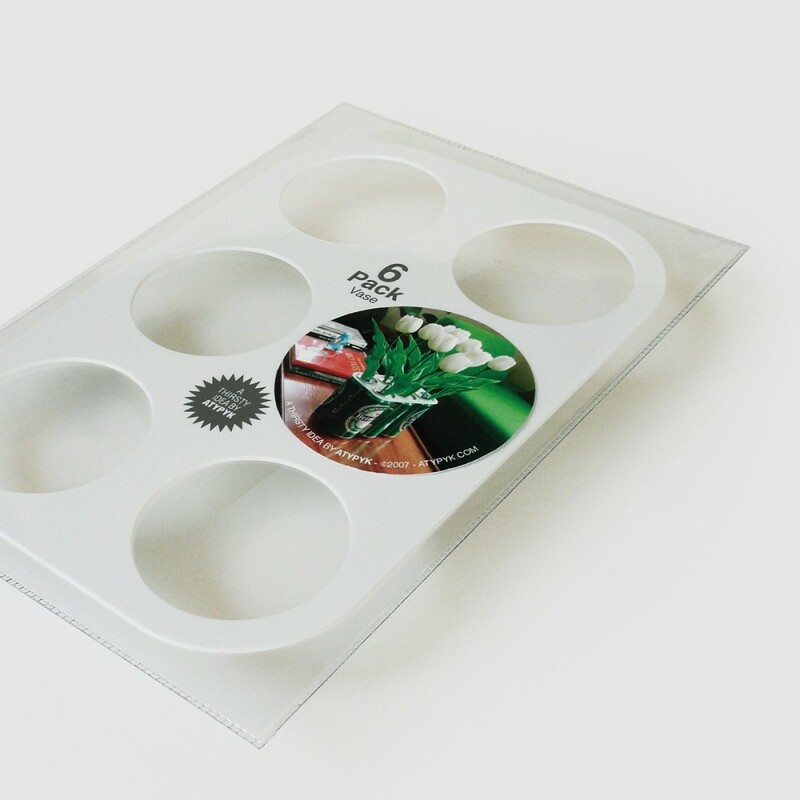 "Quench your flowers’ thirst in eco-friendly containers. Drink beer first, though. Or soda. 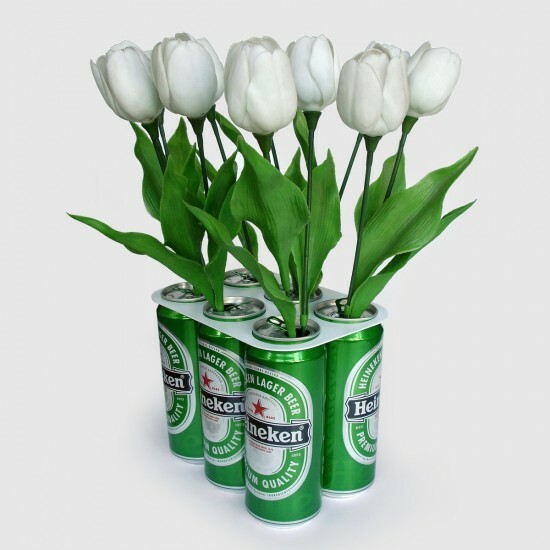 You give a little to get a little to give a little with a six pack vase." "ATYPYK: Best. Shopping Website. Ever. I laughed when I saw this vase made from a 6pack of Heineken on Josh Spear, and followed it to the designers, Ivan Duval and Jean Sébastien Idés, two guys in Paris who have churned out more brilliant stuff in a couple of years than most people do in a lifetime, making 99% of it in France and throwing it all up online for sale at reasonable prices. Umbrellas with gun handles, blinds that look like your window has been bricked up, clocks made out of paper plates, weights made out of vegetables, it goes on and on. Funny and brilliant at ATYPYK. Follow the Quench line first."